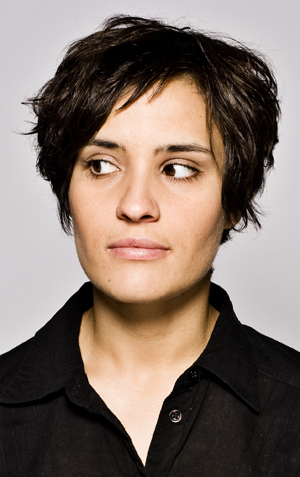 Jen Brister was born in Kingston-Upon-Thames and was schooled by nuns at Ursuline Convent until she progressed to Richmond College and then Middlesex University where she studied Drama. At university, she undertook a comedy course and, laughing in the face of heckler-fear, she did her first gig at the end of her third year in 1996. Unfortunately, whatever horrors abounded at that gig caused Jen to abandon all ye hope, pack up her troubles in her old kit bag and head off into the sunset to travel the world. While she was away, she discovered her love and talent for writing. A year later in Melbourne, she took her work to the stage and tried her hand at open mike nights in different clubs. In Sydney, she was offered an open spot at the Mardi Gras festival and buoyed by her success, she returned to Blighty. Throughout 1999, she dabbled in open mike nights in London before entering the BBC Comedy Awards in 2000. Her quick wit and sharp tongue saw her through almost all the way before she was pipped at the post in the Semi Finals. She may have lost out on the title, but picked up a celebrity fan along the way in the form of the late, great Spike Milligan. Rumours that he voted for her because “she has great bristols” are unproven….. Following this, she reached the semi finals again in the Avalon Comedy Search before breaking the curse of the semis and making it into the final of the Wilkinson Sword Comedy Competition in 2002. The finals were held at the Edinburgh fringe festival and although she didn’t win, her profile was raised significantly and she was able to start gigging regularly once back inside the M25. In 2003 along with some friends, created the sketch group Loose Connection and worked the sketch circuit. After two years, the group came to a natural end but Jen continued to write alone, the fruits of her labour having developed into her one-woman show, Me, My Mum & I that she is took on tour culminating in a successful run at the Edinburgh Fringe Festival 2006. In 2007 Jen reached the dizzy heights of radio where she presented numerous shows on BBC 6 Music including the weekend overnight show and the Weekend Breakfast Show. She regularly deps for a number of presenters and will start her own afternoon show on 6 Music from September 2008. Jen is currently working on her second Edinburgh Show, ‘Reception’ this time with comedy actress Clare Warde. You can also catch Jen in regular slots at gigs in various venues all over the country.